Fat You may have been told that cardio is the ultimate fat burner, but that effect stops the minute you hop off the treadmill. Build MORE MUSCLE and you’ll keep your body burning fat all day long. According to one study, adding just two sessions per week of heavy lifting can reduce your body fat by three percent without cutting calories. 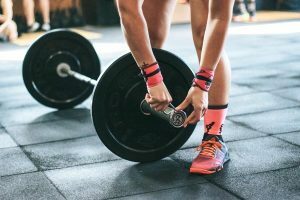 Another study from the University of Alabama in Birmingham showed that dieters who lifted heavy weights lost the same amount of weight as dieters who did just cardio, but all the weight lost by the weight lifters was primarily fat while the cardio queens lost a lot of muscle along with some fat. And more muscle, less fat translated to smaller clothing sizes than their less muscular counterparts. Love the lean, defined muscles on super-fit ladies? If women want more definition, they should lift heavier since they cannot get bigger muscles because of low testosterone levels. So, lifting heavier has the potential to make women more defined. Here at Fitnessworx we have a number of strength and conditioning classes every week to get you started! You may burn more calories during your 1-hour cardio class than you would lifting weights for an hour, but a study published in The Journal of Strength and Conditioning Research found that women who did weight training burned an average of 100 more calories during the 24 hours after their training session ended. If you want to include heavy weight sessions in your gym sessions book in for an assessment with one of our instructors and we’ll get you on your way! Injury Achy hips and sore knees don’t have to be a staple of your morning run. Strengthening the muscles surrounding and supporting your joints can help prevent injuries by helping you maintain good form, as well as strengthening joint integrity.